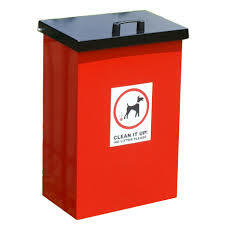 Dog Bins are provided throughout the village and on the recreation grounds. They are emptied by Amber Valley Borough Council, who are also the responsible body when it comes to imposing fines, clearing up, etc. The Parish Council also supply and empty several bins along Stiles Walk and around the village. Fed up of dog fouling outside your home? 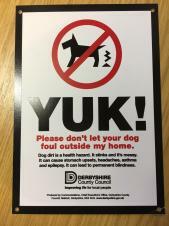 Derbyshire County Council produces FREE signs as shown in the picture for you to display, the signs are weatherproof and can be attached to your garden fence or a nearby lamppost etc. The Parish Council has a small supply which can be obtained from the Weston Centre office, alternatively Duffield Library should have copies available.